NFL Punt, Pass and Kick at Louisville Champions Park on September 29th | Louisville, Kentucky | Joe Hayden Real Estate Team - Your Real Estate Experts! Families that love sports will not want to miss the NFL Punt, Pass and Kick event on Saturday, September 29th at Louisville Champions Park, 2050 River Road from 10am to 2pm. This event is part of the ongoing NFL PLAY 60 program and is one of the original grassroots initiatives that the NFL supports. The NFL Punt, Pass and Kick event invites both spectators and participants to attend and enjoy one of the sports American is best known for. The registration for PLAY 60 is free and open to both boys and girls from age 6 to 15. Age groups are separated into divisions so that the game is fun and fair for all that play. 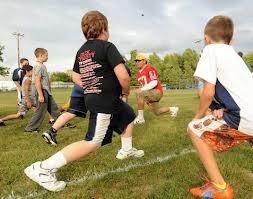 The Punt, Pass and Kick program was created to reach younger children, allowing them to experience the fun of football. Participants are educated through engaging game play in a supportive and safe 'no-contact' football environment. The event is structured around the kids that play and the parents that support them, along with volunteers and supporters that organize the events. Louisville Champions Park is proud to host this event that emanates an environment of sportsmanship and teamwork, and instills those values in the youthful participants. Whether you are a player or spectator, the NFL Pass, Punt and Kick event on September 29th will be an exciting day for families that enjoy football.